:Mackenzie Allen Phillips's youngest daughter, Missy, has been abducted during a family vacation. Evidence that she may have been brutally murdered is found in an abandoned shack deep in the Oregon wilderness. Four years later, in the midst of his great sadness, Mack receives a suspicious note--apparently from God--inviting him back to that shack for a weekend. Against his better judgment, he arrives at the shack on a wintry afternoon and walks back into his darkest nightmare. What he finds there will change his life forever. 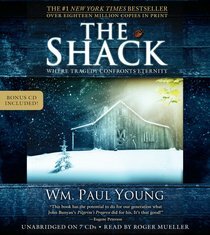 About "The Shack (Unabridged, 7 Cds)"
Paul was born a Canadian and along with three younger siblings was raised among a stone-age tribe by his missionary parents in the highlands of what was New Guinea (West Papua). The family returned to Canada where his father pastored a number of churches for various denominations. By the time he entered Canadian Bible College, Paul had attended a dozen schools. He completed his undergraduate degree in religion at Warner Pacific College in Portland, Oregon. While in Oregon, Paul attended seminary and worked on staff at a large church where he met and married Kim. Together they celebrate the wastefulness of grace with their six children, two daughters-in-law, and now two grandchildren. His worldwide phenomenon, The Shack, was written for his six children, with no thought or intention to publish. He says "It is as much a surprise to me as to anyone else that I am now an author. And a best-selling author at that! Customer Reviews For "The Shack (Unabridged, 7 Cds)"
I don't usually listen to audio books, but someone gave this to me as a gift and I loved it. I really enjoyed listening to this story, and would recommend people to give the audio book a try.